Since before I can remember, I’ve pinned countless gorgeous white kitchens on my kitchen Pinterest board. 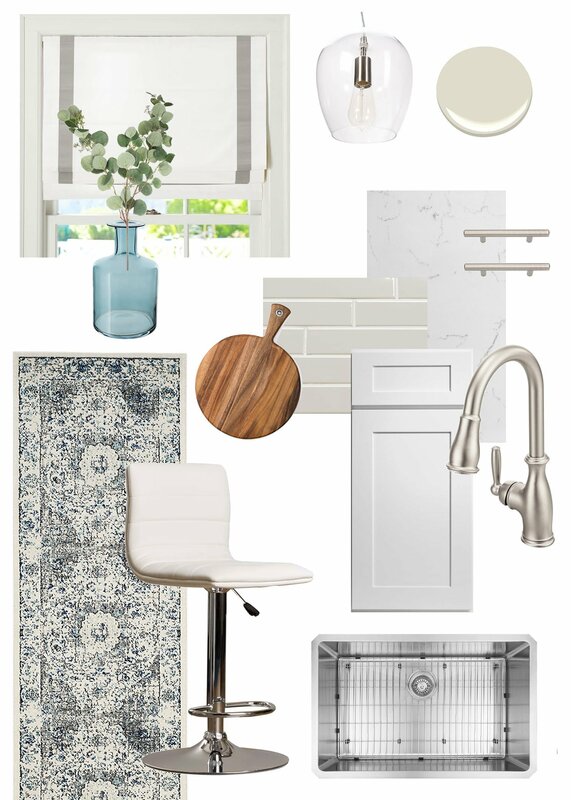 Because of the ups and downs of our kitchen renovation, and because I often suffer from decision paralysis, it took me a long time to decide on colors, tiles, and textiles. I mean, let’s be honest. Picking out a nail polish color at the nail salon is my own version of hell, haha. That should give you an idea of how long it took for me to put all of this together. Our kitchen is still under construction, but as soon as it’s done I promise to do a grand reveal! Until then, here are the items I’ve purchased to make our white and gray kitchen the focal point of our home. I fell in love with the simple and classic look of this white Roman shade with gray ribbon from Pottery Barn. To be honest, I planned the window trim all around that Roman shade! I think I may try to DIY this but I’ll keep you posted! When choosing our Moen faucet a few years back, I knew that this faucet would work with a future kitchen remodel. You can find it here for less than the retail price. I never knew hardware was expensive. Color me shocked! Our new cabinets have over 40 doors and drawers, and the drawers were next to impossible to open without them. I wanted pulls that would complement our faucet and pendants, and these ones fit the bill. I am in LOVE with my three pendants! 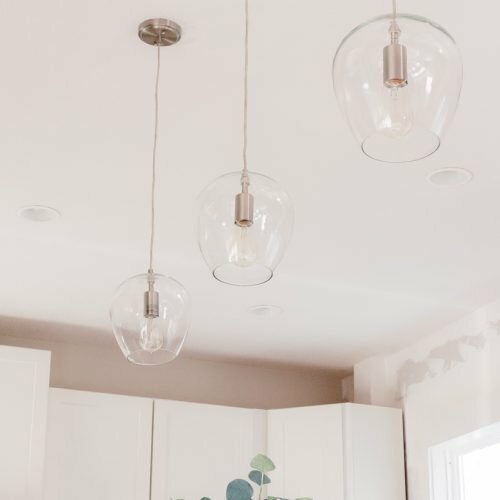 See the installation of these pendants, and learn how I decided on three of them, here. 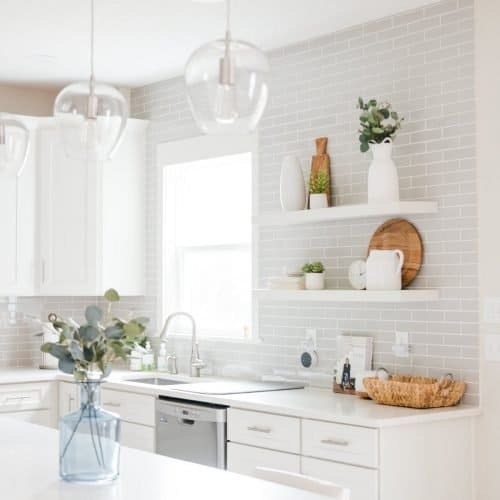 After deciding on white shaker cabinets (read more), something I was reluctant to do because it is currently SO trendy, and knowing I wanted white counters with gray veining, I was left with choosing the backsplash. 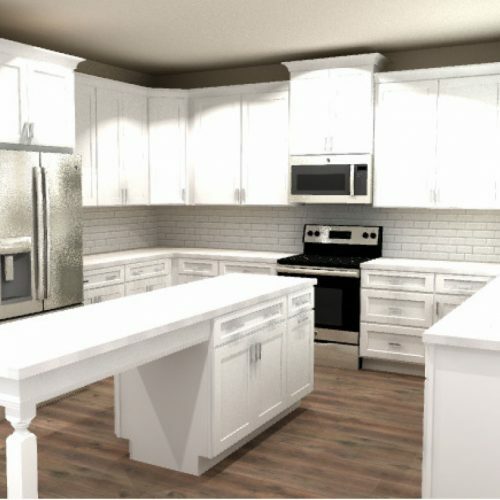 This was the most challenging part of the kitchen design. I didn’t want to make the wrong decision because, unlike paint, this was not an easy thing to change once it went up. Sure, it can be a DIY job, but to tear out the wrong tile to start over again makes my hair stand on end. Initially I was going to go with this gorgeous white subway tile to help brighten up the space, but I was concerned with it looking too white while giving of a sterile hospital vibe. The tile’s irregularities render it beautiful. Then I seriously considered this ceramic tile mosaic that resembled marble subway. That is until I looked at it up close and saw the poorly pixelated marble print. For tile that would be at eye-level it was too much of a risk. 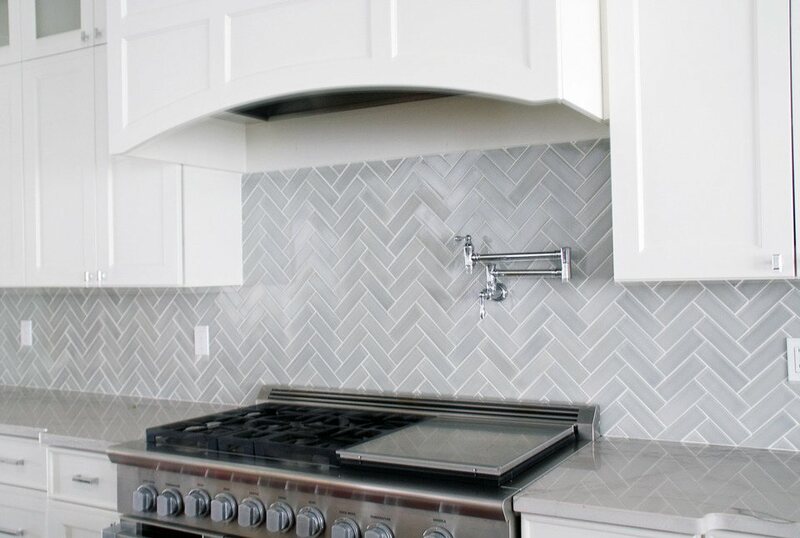 When I saw this herringbone pattern with 2 x 6 subway tiles from Fireclay Tile I fell in love. However, at $28/sq. ft. it would break the bank. I finally settled on this light gray 2 x 8 tile with bright white grout. It is absolutely gorgeous! The gray color is a dead match for the FireClay tile at an affordable price. Brian really wanted the off-set subway pattern, and even though I loved the herringbone pattern, it would have also raised the cost of labor. So we settled on the off-set subway pattern. Another piece of the puzzle that I deliberated over were our counter height stools. We wanted five chairs (many are sold in sets of two) for our island + table combo. 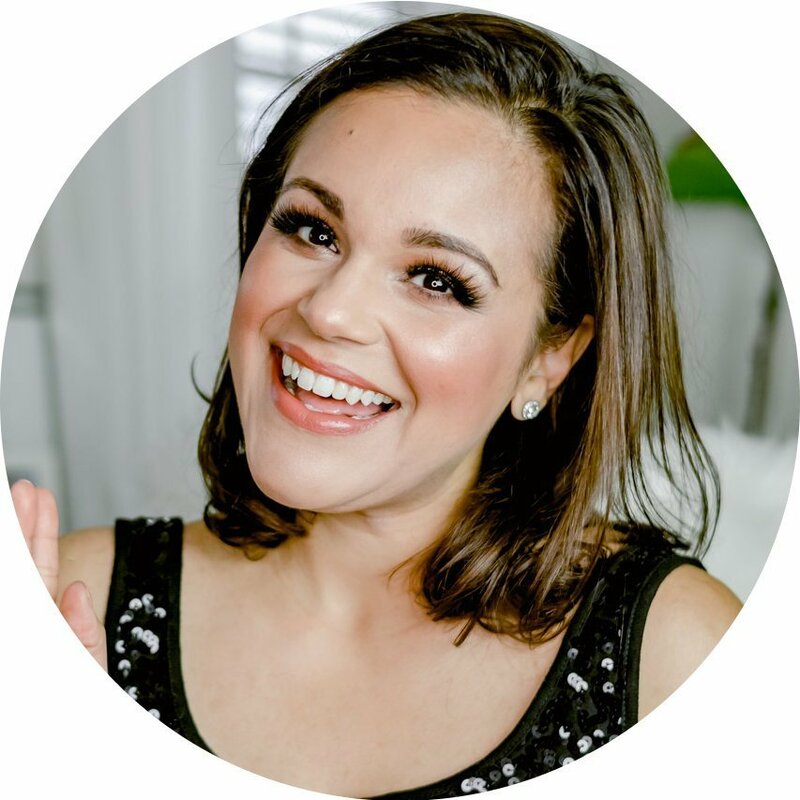 I wanted to make sure they were the perfect trifecta of sturdy, stylish and comfortable…and under budget. After lots of online shopping, I found these comfortable, faux leather adjustable swivel chairs. The entire seat and back are padded, ensuring that they won’t bang the countertop when used. We have already gotten lots of use out of them and couldn’t be more pleased with our purchase! I love walking barefoot indoors, but don’t necessarily want to stand on a cold tile floor as I cook or do dishes. We did not replace our flooring during our reno (since that would require replacing all the flooring of the first story) but I did want to compensate for this by adding three runners in our U-shaped kitchen. These three runners were exactly what I had envisioned! 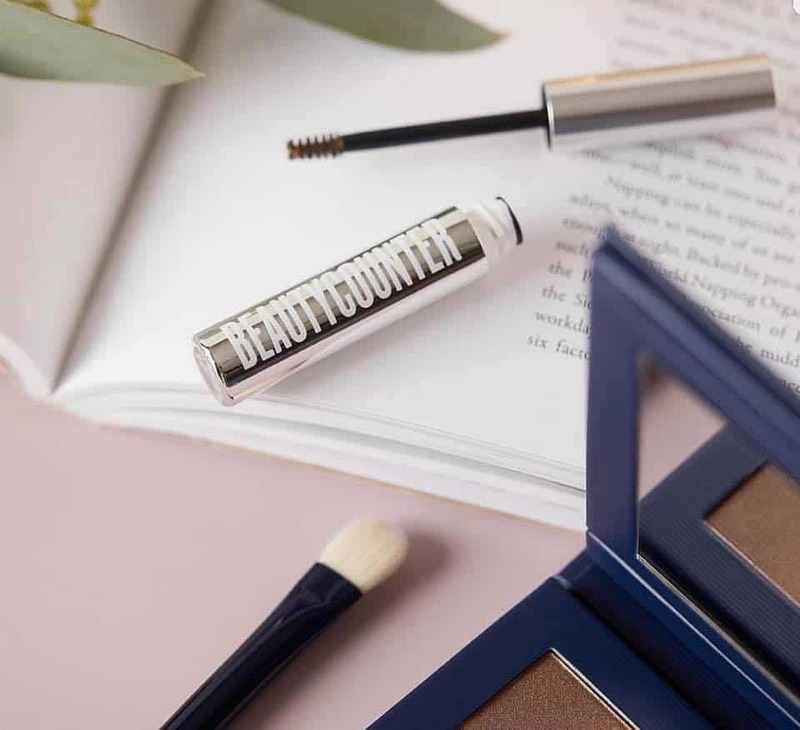 Neutral with a touch of blue (my fave color, obvs) with a pattern that resembled classic Persian rugs that also hid accidental spills. Let’s be honest here, haha. I can’t wait until they arrive! After our old backsplash, what I was happiest to see go was our old Santa Cecilia granite. The color scheme was not to my liking, but there were tons of chips and cracks all over it. The area around our sink I held together with a granite repair kit. We purchased our quartz countertops from New View Granite in Jacksonville.  While I’m not sure where exactly the quartz is sourced from, I can tell you it is called Siena Carrara Quartz by Marble Quality. It resembles this quartz pretty well. All of the heart eye emojis for our undermount sink! I love the grate at the bottom, as it allows water to drain even when it’s full of dishes. We have this 30″ undermount sink and we love it. While we were at it, we also sprung for a ridiculously quiet garbage disposal. It is honestly worth every penny! Find all of my kitchen accessories on my Amazon shop. What has been your favorite kitchen purchase? 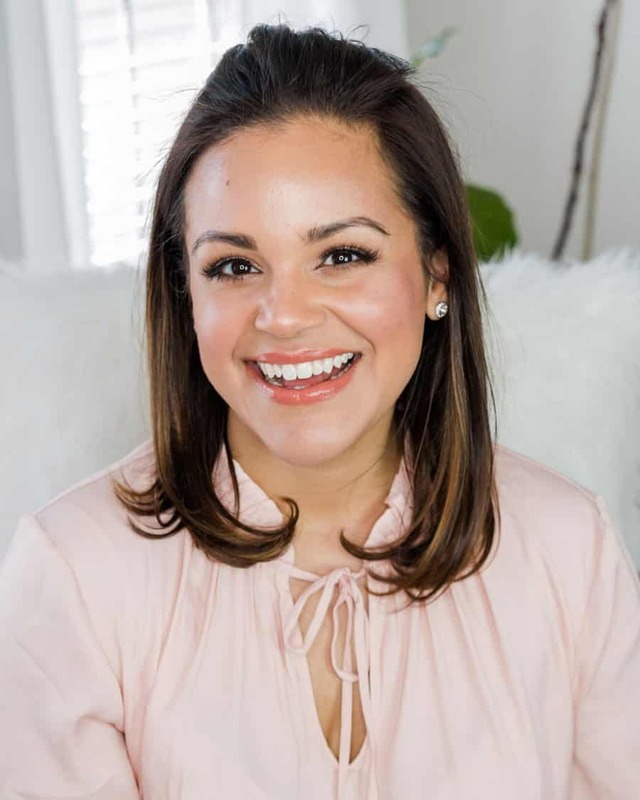 I’m trying to find a way to DIY those same shades! We only need 2 for our kitchen, but that’s still almost $500! It will be so much cheaper to buy plain white roman shades and some ribbon from Michael’s. I’m just not sure on how I plan on attaching the ribbon yet.